I-295 shifts slightly south and begins to descend at a 3.5%± grade close to New St. Mary's Cemetery. The road reaches a depth of 60' in the northwestern corner of New St. Mary's Cemetery, and a depth of 35' below the I-76/Route 42 pavement. The roadway begins to ascend at a 4% grade beside the baseball fields and is at grade to meet the I-295 pavement north of the Creek Road overpass. Vehicles on northbound Route 42 whose destination is I-295 northbound, exit on Ramp A, which would be separated from, but parallel with, Route 42. This ramp configuration, in conjunction with the new I-295 mainline alignment, eliminates the current substandard weaving condition with Ramp E at this location. Ramp A then crosses under Ramp E before joining the depressed I-295 alignment north of Browning Road. I-76. Ramp C provides the movement from southbound I-295 to southbound Route 42. Ramp C exits I-295 from the right and Ramp B exits from the right approximately 1,000' further. Ramp B follows a similar path but to the south of its existing location to meet I-76 northbound. Ramp C crosses over Ramps B and D, and I-76. Then Ramp C passes over Browning Road and I-295 to connect with Route 42 north of the Creek Road Bridge. Southbound I-76 traffic heading to I-295 southbound utilizes Ramp F. Ramp F diverts from I-76 from the right (existing exit is from the left) and then passes under Browning Road. Ramp F first runs parallel to Ramp C and then runs adjacent to I-295 southbound. Ramp F rises from a section at Browning Road to tie into I-295 southbound prior to Essex Avenue. Three local bridges are impacted by each of the alternatives. 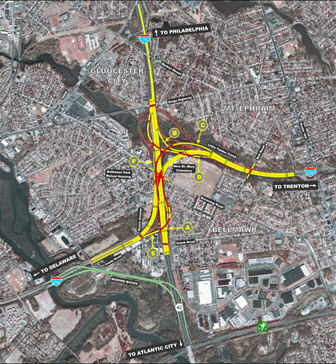 The Bell Road, Browning Road, and Creek Road bridges will be raised to provide proper vertical clearance and lengthened to accommodate the wider typical section of I-295 or I-76/Route 42. In addition, King's Highway will be lowered by approximately one foot under each alternative and Alternative K may require Essex Avenue to be lowered by approximately two feet.